Unlike other claimed anti-bacterial screen protector films in the market, SaniFilm Anti-Bacterial contains a medical class bacteria killing solution. This sterile technology consists of a silicon and zinc nano compound that has been proven to kill bacteria effectively in lab tests. This nano compound is non-toxic (tested on human skin) and has a long acting ability of killing bacteria. Why do you need SaniFilm Anti-Bacterial? Touch screen devices are a part of everyday life and are often being share-used. This raises the risk of infection significantly. 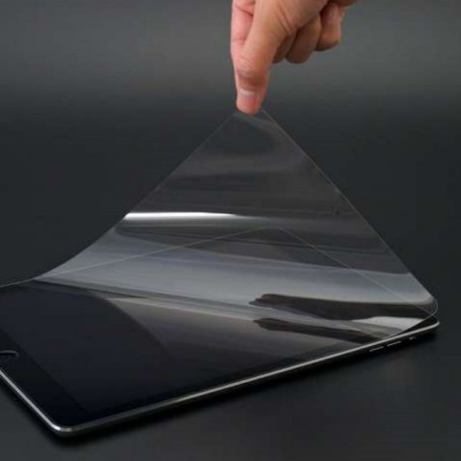 SaniFilm Anti-Bacterial screen protector is designed to kill bacteria effectively and reduce the risk of infection. This is why SaniFilm Anti-Bacterial is a must-have product for all places where touch screen devices are being shared, medical environments especially. How does SaniFilm Anti-Bacterial work? A bacteria cell wall is usually negatively charged. When the bacteria touches the positively charged zinc ion (of the nano compound), it will generate an uneven tension and break the cell wall of the bacteria. Once the zinc ion is connected to the bacteria, it causes protein deterioration and the bacteria will die.